Seagull atop a stanchion on the Fort Point Bridge. what a beautiful bird! and a wonderful picture! 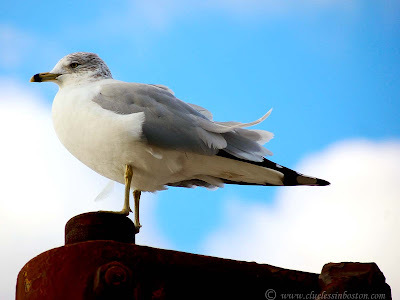 A ring-billed gull! (I am trying to learn my gulls). Wonderful photo. We have these here on Lake Memphremagog. He looks so smug, but you know he is freezing his tail feathers. I'm crazy for photos of seagulls, and this photo right here is why. Thanks!